England forward Toni Duggan says success at this summer's World Cup can improve crowd numbers in the Women's Super League. The average attendance for WSL matches this season is 937 - a 13% increase on last year but still short of the Football Association's target of 2,020. A record 45,423 watched Chelsea beat Arsenal in the 2018 FA Cup final. "We seem to get it right for FA Cup finals but we can't seem to for league fixtures," Duggan, 27, said. A crowd of 60,739 watched Duggan's Barcelona beat Atletico Madrid in March, setting an attendance record for a top-flight domestic women's game in Europe. "It doesn't happen every single week in Spain, but it's happening a lot more and that's a positive for the women's game," said the former Manchester City player. "We've reached an unbelievable standard at the minute. Hopefully England can have some success in the summer and we can build from there." 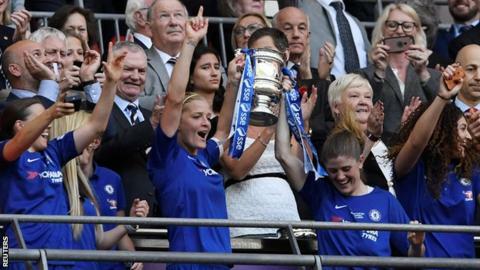 The largest crowd to watch a WSL game in England is 5,052 when Arsenal played Chelsea in 2012. Barclays announced a three-year sponsorship deal with the WSL in March in the same week that top-tier club Yeovil Town Ladies went into administration. Duggan's international team-mate Mille Bright wrote in her BBC Sport column about the financial struggles domestic players can face. "I've been at Barcelona two years now and to see the strides that have been made already is amazing," Duggan added. "Hopefully it will be England next and they'll do the same for a league game." England face Spain in a World Cup warm-up match on Tuesday at Swindon Town.